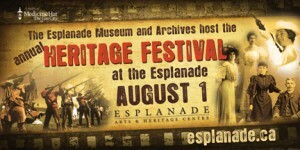 This weekend is heritage day long weekend and as part of the celebrations, The Esplanade is hosting a public one-day festival on Saturday, August 1st from 10AM to 4:30PM. In Alberta, Heritage Day is a civic holiday celebrated on the first Monday in August to increase community awareness of Alberta’s heritage and to celebrate the history of the province. For more information, view the Heritage Festival section at the Esplanade website or download the brochure (PDF).